David Shayne, un autor teatral del Greenwich Village, se considera un artista y ha dicho que él jamás haría concesiones en su nueva obra. Su productor, sin embargo, le ha encontrado como patrocinador a un mafioso que aportará el dinero sólo si su amante Olive, una chica sin experiencia ni inteligencia, hace un papel principal. John Cusack, Jack Warden, Tony Sirico, Chazz Palminteri, Joe Viterelli, Jennifer Tilly, Rob Reiner, Mary-Louise Parker, Dianne Wiest, Harvey Fierstein, Jim Broadbent, Tracey Ullman, Victor Colicchio, Louis Eppolito, Gene Canfield, Peter Castellotti, John Di Benedetto, John Ventiniglia, Lisa Arturo, Rachel Black, Alison Cramer, Kelly Groninger, Jennifer Lamberts, Carol Lee Meadows Mitchell, Jo Telford, Meghan Strange, Leigh Torlage, Debra Wiseman, Paul Herman, James Reno, Stacey Nelkin, Margaret Sophie Stein, Charles Cragin, Gerald E. Dolezar, Nina Sonya Peterson, Shannah Laumeister, Fran McGee, Annie Joe Edwards, Brian McConnachie, Edie Falco, Kernan Bell, Hope W. Sacharoff, Debi Mazar, Nick Iacovino, Frank Aquilino, Sam Ardeshir, Molly Regan, Phil Stein, John Doumanian, Dayle Haddon, Tony Darrow, Howard Erskine, Benay Venuta, Ken Roberts, Jennifer Van Dyck, Peter McRobbie. 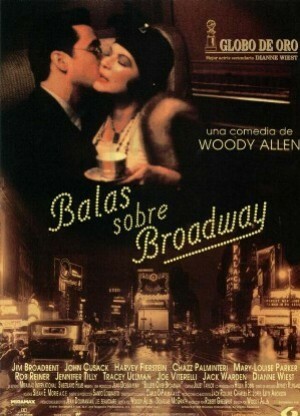 Woody Allen (Dirección), Carlo DiPalma (Montaje).